The Configuration Menu allows you to change many different controls and settings in Pool Studio and VizTerra. Everything from the speed of the automated tour to the measurements and language Pool Studio or VizTerra displays can be adjusted in Configuration. The different controls and settings are divided into tabs. Some options require that you restart Pool Studio or VizTerra before they will take effect. 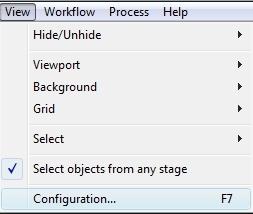 Opening the Configuration Menu: You can access the configuration menu by going to the View menu and selecting Configuration or by pressing F7 on your keyboard. The full Configuration menu is only available when you have a design loaded. The majority of the Configuration options are not available from the Main Menu. The Presentation Tab allows you to control the appearance and quality of the Presentation Mode. Please Note: These features are completely dependent on your computer’s hardware. Features your computer hardware is not able to display will be grayed out. Display Resolution: This slider will allow you to adjust the resolution of the Presentation mode. In order for your presentation to be full screen, you will want to set this resolution the same as your monitor’s resolution. Display Quality: This slider allows you set the display quality for the presentation mode. The higher the quality, the greater detail your presentation will show. The lower the quality the faster your computer will run. You can choose a custom display quality by using the More 3D Options button. Your display quality is completely dependent on your computer’s hardware, features your computer cannot display will be grayed out. You can access this menu by pressing the More 3D Options button in the Presentation tab. These controls allow you to set a custom display quality. A preview of each option will appear in the Visual Effects Preview box. These features are completely dependent on your computer’s hardware. Features your computer hardware is not able to display will be grayed out. Turning off these features will improve computer performance if Pool Studio or VizTerra is running slowly. 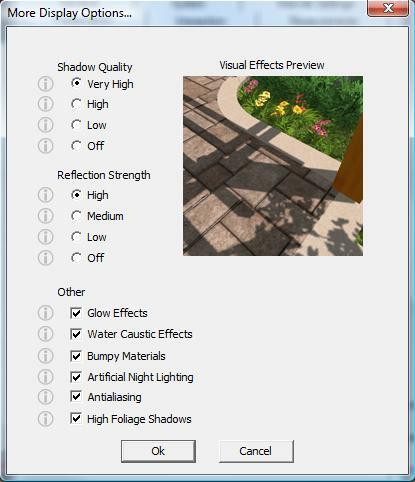 Shadow Quality: Shadow quality allows you to turn shadows on or off and set their detail. Reflection Strength: Reflection strength controls how reflective bodies of water are in your design. You may set the strength or turn it off completely. Other Visual Effects: These effects may be turned on or off with the checkboxes. Glow Effects: This effect creates a glow around sources of light in the design such as the sun or yard lights. Water Caustic Effects: This effect creates the shimmering of light across bodies of water. Bumpy Materials: With this effect turned on, surface materials will have more depth and appear more realistic. Not all materials support this feature. Artificial Night Lighting: This feature allows lights to illuminate the surrounding area when in night mode in the presentation. Antialiasing: This feature smooths out the edges of shapes to create a softer and clearer picture in 3D. High Foliage Shadows: With this feature turned on, shadows cast onto plants and trees are crisper and more defined. You can access this menu by pressing the More 3D Options button in the Presentation tab when the Ultra Level of Display Quality is selected. 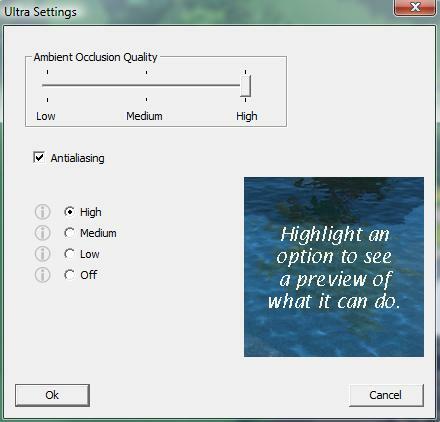 Ambient Occlusion Quality: Select the level of the Ambient Occlusion feature. Ambient Occlusion creates shadows in places where light is not cast, such as the inside of structures. The Video Tab allows you to set options for the video capture feature of the Presentation Mode and enter your YouTube account information for uploading videos online. Resolution: This control will allow you to select a resolution for videos created in the Presentation Mode. 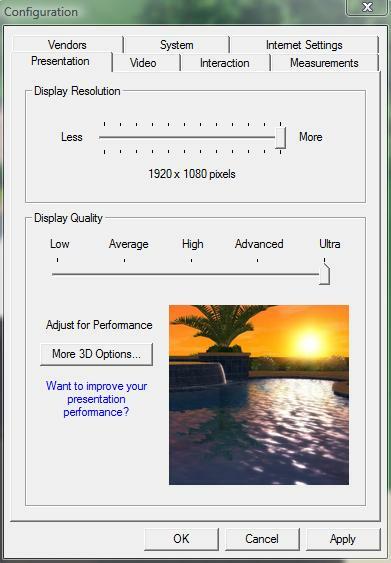 You may select a Standard or High Definition resolution or you may enter your own Custom resolution. When you use the video capture feature in the Presentation Mode, the video you create will be saved with your selected resolution. Higher resolutions will increase the quality of the video as well as increate the video’s file size. Use set speed when recording: With this box checked, the speed of movement when recording video is at a set, slow, steady pace. Uncheck this box to use the speeds set on the Interaction tab. Prompt to upload video: With this box checked, after taking video in Presentation, you will be given the chance to upload it to YouTube immediately after exiting Presentation. Prompt to upload video in Pool Studio: This control will allow you to select a resolution for videos created in the Presentation Mode. You may select a Standard or High Definition resolution or you may enter your own Custom resolution. When you use the video capture feature in the Presentation Mode, the video you create will be saved with your selected resolution. Higher resolutions will increase the quality of the video as well as increate the video’s file size. Prompt to upload video in VizTerra: With this box checked, after taking video in Presentation, you will be given the chance to upload it to YouTube immediately after exiting Presentation. YouTube: You may enter your YouTube account name and password here. The program will save this information for use when you upload videos you have created in the Presentation Mode. 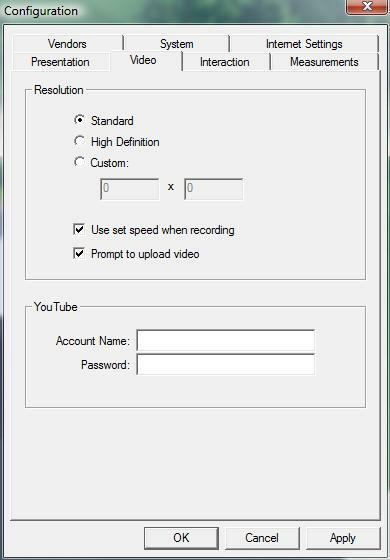 You may upload videos by selecting Upload Videos to YouTube from Export in the File Menu. If you do not have a YouTube account you may create one by visiting the YouTube web site. The Interaction Tab allows you to control movement in the Presentation Mode. Walk Speed: This slider will allow you to adjust the speed at which you move while in walk mode. 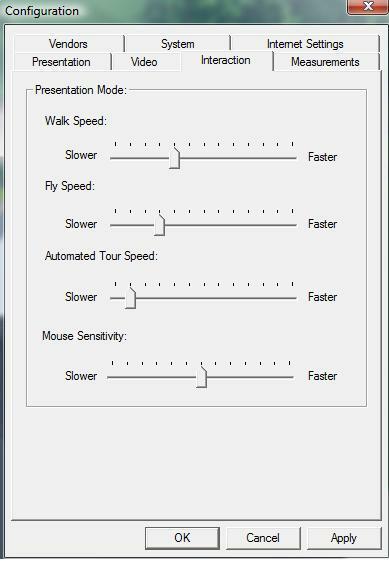 Fly Speed: This slider will allow you to adjust the speed at which you move while in fly mode. Automated Tour Speed: This slider will allow you to adjust the speed at which the automated tour rotates. Mouse Sensitivity: This slider will allow you to adjust how sensitive the mouse is to your movements. The Measurements Tab allows you to set the measurement system Pool Studio and VizTerra will use and change the scale of the labels in each program. Units: This control will allow you to set the measurements Pool Studio or VizTerra will display while you design. You may choose from Standard/Imperial English units or Metric units. All measurements in the program will instantly change, including shapes you have already drawn. Labels: These controls allow you to adjust the scale at which labels in the program will appear on the screen and print out. PLEASE NOTE: We do not recommend changing these settings from 100%. Lock Print to Screen: This check box will lock the print scale to the screen scale. Uncheck it to set a different print scale. 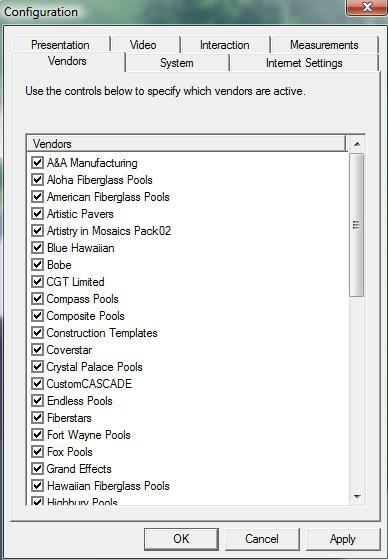 The Vendors Tab allows you to control which vendor packages appear in the library. You can turn off vendor packages you don’t use to clear the items out of the library. You must restart Pool Studio or VizTerra for these changes to take effect. Vendor Checkboxes: All vendor packages currently installed will appear in this list. To turn off a vendor package simply uncheck it. Once you restart Pool Studio or VizTerra the package items will no longer appear in the library. You may turn the package back on by returning to this tab. Dealer Specific Vendors: Some vendor packages contain items only used by specific dealers. These packages install with the program but are turned off by default. You may turn these packages on by clicking on check box. The System Tab contains settings for several different features in Pool Studio and VizTerra. Most importantly, this is the tab where you can change the display language for Pool Studio or VizTerra. License Transfer: Click this checkbox to have a transfer license reminder message appear each time you close Pool Studio or VizTerra. This control also appears when you choose Transfer License from the Help menu. Construction Wizard: Click this checkbox to have the Construction Wizard appear when you go to the Construction Stage for the first time in each project. This control allows you to turn the Construction Wizard back on after you have turned it off in the Construction Stage. Language: This drop down box will allow you to select the display language for Pool Studio or VizTerra. By default, Pool Studio and VizTerra display the same language as the operating system on your computer. If you wish to use VizTerra in another language, you may change it here. You must restart Pool Studio or VizTerra before this change will take effect. 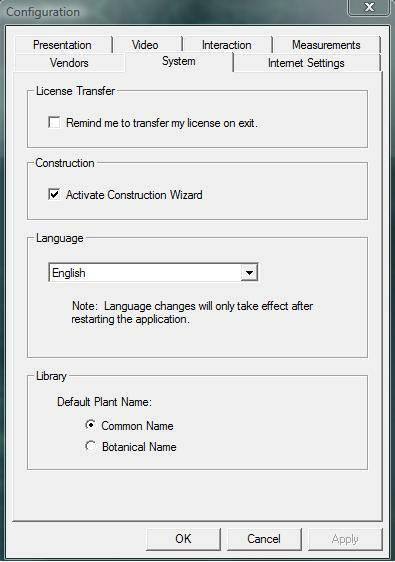 VizTerra Library: This control allows you to change how plants and trees are listed in the library. Landscaping may be listed by either common or botanical names. This control will affect all landscaping in the library. 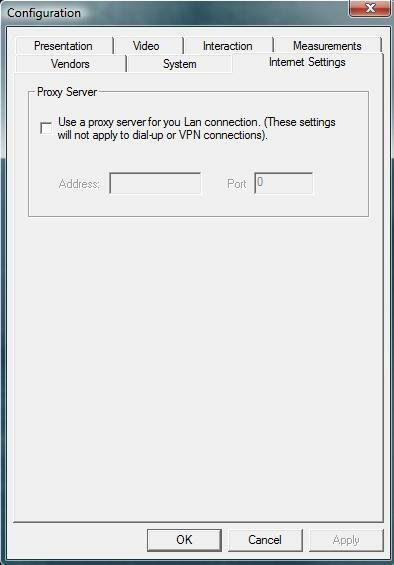 This tab allows you to change Pool Studio or VizTerra’s internet settings to use a proxy server. Proxy Server: This control allows you to configure Pool Studio or VizTerra to connect to the internet through a proxy server.